Foosball, or Table Football, is a widely-known game/sport that you may remember from your childhood as the game where you spun the rods really fast so the little players would do flips. 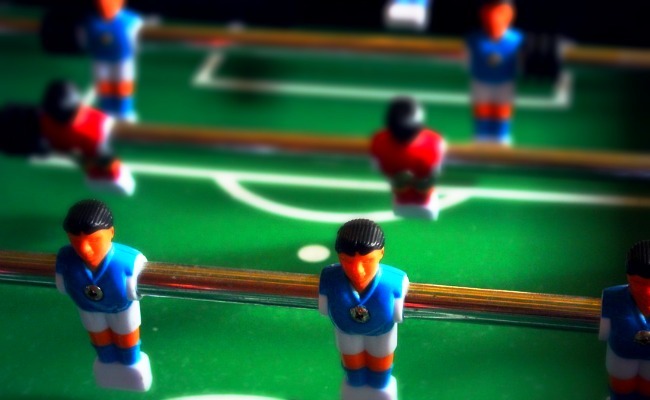 Little did you know back then that the world of foosball was so vast and complicated, spawning professional foosball players, competitions, and associations dedicated to the game! The game of foosball was invented in 1922 by Harold Searles Thornton, an avid football fan from the UK who came up with table football as a way to achieve the excitement and fun of football in the comfort of his own home. His uncle, who lived in Oregon, brought the patented foosball idea back to the US, where it promptly tanked. Years later, the game would see a resurgence of popularity, both in the UK and US. During the 1950’s, leagues of foosball players starting popping up in Europe, followed by the US in the 60’s. The first American-made foosball table was created in 1970, to the delight of many basement dwellers and man cave enthusiasts. The objective is easy enough: drive the ball toward your opponent’s goal to score! Foosball is typically played in a Singles or Doubles match, with one or two people are either side of the foosball table, controlling a total of 8 rods (4 on each side) with 13 “players” on each side. Another way to play is called “Goalie War,” where each player can only control the goalie rod. The foosball table is set up with your own goal on the left side with a sliding, or abacus-style, score counter. Next, on the playing field are 2 sets of rods with a total of 5 players on them; this is known as your “defensive zone.” In the center of the field is a singular rod with 5 players on it, known as the “midfield row.” Your last rod is the closest to your opponent’s goal, called the “striker row,” which is your offensive rod consisting of 3 players. If you can follow these rules, you can probably play foosball. To start, it’s customary to flip a coin to see who will “serve,” meaning either drop the ball in the middle or through a hole in the side of the table. On your defensive end of the table, the main concern is keeping the ball away from your opponent’s striker row. Use the inside players as your main blocking components, and the outside players to maneuver and take control of the ball if it coasts into a corner. As a common sense no-no, don’t try to shake/move the table or bang your players in the side of the table. If you get the ball down to your offensive line at the other end of the table, use your 5-player rod mainly for passing to your 3-player rod. However, if you have a good shot with your 5-player rod, go for it! Just keep in mind that the ball has farther to travel and you may not have the best chance with the other rods it needs to pass through. Once you get your ball to the 3-rod players, do a little fancy footwork while keeping the ball in a safe area under the rod to outwit your opponent. 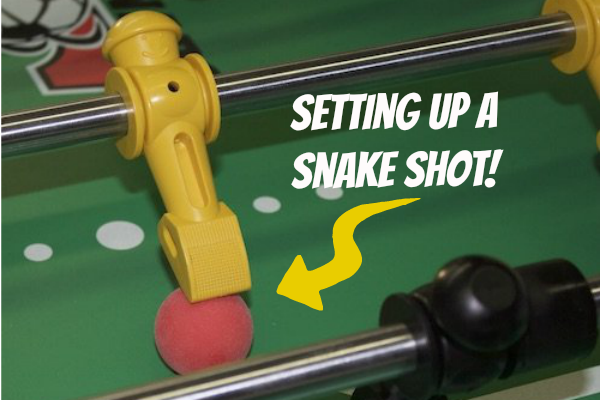 One of the best “trick shots” in foosball is the the rollover, or “snake shot,” where the middle offensive man on your 3-player rod pins the ball between his little armless body and the table. This shot is taken with an open hand as your wrist pins the man on top of the ball in a forward position. The man is then moved laterally left or right and your wrist is rolled up the handle of the rod in order to strike the foosball in a swift backwards spin to confuse your opponent and score! Remember: you can only keep the ball for 10 seconds before you have to either pass or attempt to score. The first player or team to score 5 points wins! At a minimum, you’ll need a foosball table and foosballs. The most important element in selecting a foosball table is the stability and durability of the table. Some might argue that cup holders are the most important- what is a game of foosball without a drinking game? What about the look and theme of the space you will be putting the foosball table? There are a lot of variables to consider, but the nice part is that once you get one, you can replace parts of it without having to replace the whole ball of wax. Have a hunting-themed den? There’s a foosball table for that. Need a tabletop foosball table for your break room? You got it. Keep in mind the amount of time you will spend playing on your foosball table; if you’re looking for longevity and want to pass your foosball table down to your grandkids, you will want to get a table that has quality construction and stronger materials. Foosballs are a different story, as they run the risk of being lost, chewed up by the family dog, or being abducted by aliens. Luckily, there are replacement packs to suit the novice to the experienced foosballer- table footballs range in texture, size, composition, and weight depending on the user’s preference, as well as design choices. Some foosball players prefer a smoother plastic foosball, while others like the denser, more textured balls. Generally you will see the dense, textured foosballs in competitive games and tournaments, like in the video below. Thanks for joining us for this edition of How To Play! Who’s Your Favorite Celebrity Of All Time?